This 7 - 10 gallon 6 micron 24" x 24" Lavex Janitorial high density can liner / trash bag is perfect for a variety of applications. Use it in restrooms, offices, restaurants, hotels, amusement parks, or outdoor recreation centers! Featuring a star seal at the bottom, this Lavex Janitorial can liner helps eliminate leaks, messes, and spills to make carrying the trash from the bin to the dumpster much easier. Nice product for smaller trash cans! Thinner lining (not that thick trash bag material). We use these on a daily bases and reorder as needed. Would recommend. i bought this product to use at hotel to line the trash cans. Quality of the product is not so good but you can order same product in 8 micron strength, overall its very good product at this rate. Heavy duty and strong! It's a great price and can hold quite a lot. Very handy and we have been using them for a long time and still plan on using them in the future as well! Really thin but they do the job. These are High density so not recommended for sharp objects. Great pricing and similar to other bags at the same mil thickness. These are really great trash liners. Not quite as thick as I had hoped, but really work well for what I need. Love that they are see-through - makes a nice security thing when employees empty trash. We know what is being wasted. These bags are NOT for 10 gallon garbage can! They may be for 5 or 7 but do not fit well in 10. Was going to return them but cost too much to send back. I thoroughly researched them and all the specs let me to believe that they would work but they do not. The liner itself seems good, it just doesn't fit properly. I bought these because they were cheap, but now I regret buying them. I should've spent a little more and gotten a better quality liner. They tend to rip if you are a little too rough with them. These bags are advertised as the right size which is a problem I've had in the past with different bags. They're thick enough to not rip and overall I am pleased with them and will order again. These bags are pretty thin but work well for office garbage's. I would not recommend them for anything more than light garbage and papers. If you need them for an office, they are worth the money and delivery was fast! I have not had a problem with these ripping (which I have with other brands). They feel a little flimsy to the touch, but have no complaints so far. These 24" x 24" can liners are ideal for small trash cans that don't require a thick bag. These are fine for paper or light trash. This 24 by 24 inch high density trash can liner is great. This is the trash liner we use in the office. It looks thin but it very resilient. We use it everyday and has not failed us yet. The price for a box of 1000 pieces is excellent. This item is really such a good value. These thin can liners are ideal for a small paper trash can or motel wastebasket. Not thick enough to contain liquids or sharp/heavy objects but an inexpensive option for a light duty bag. These light-duty trash can liners are fine for paper trash or lining a small paper wastebasket. Won't hold up to heavy, wet or sharp trash but fine for daily use. Good price, but there's no way in heck these fit a 10-gallon wastebasket. Way too small, 7-gal is the max. Pretty thin too, like hotel room trash can bags. Not returning, but don't think I'll reorder. Super thin. For light trash / paper towel waste it's OK, but for a trash bin that collects more than a few pounds of trash these bags are not strong enough. The bags are easy to puncture as well, drinking straws will punch through very easily. I unsuccessfully tried to double them up. Not suitable for household kitchen use. Perfect bag for waste cans for a hotel room. We use them for in room as well as bathroom, Strong durable leak proof, outstanding price. We purchased these trash bags to go with our 28qt black trash cans. These come in 1000 per case and they are very reasonably priced. These bags should not be used when a lot of liquid may be present as they do have the tendency to leak. Super duper cheap on webstaurant! 1000 pieces of garbage bags! i highly recommend shopping from webstaurant. They have never let me down with their products. These are pretty thin and a little smaller than I expected. So although the price is very good you may want to factor that in. Bought these bags because SAMs was out of stock in this size. For the price you pay the bags are worth the annoyance. They are super thin and will tear without stress being put on them. I wouldn't recommend them. These are perfect little bags for bathroom garbage cans. They are frosted which is nice - we use them in mesh cans, and you cant see the trash through the sides. We use these for the trash in our bathroom at our event venue. We get a lot for the money, and haven't had any issues so far. These bags are what we put our wrapped smoked fish in. They are the perfect length for putting a fish in it. Even though they feel thiner than what we had before I haven't had very many rip. This bags work great and fit good on my 28 qt waste basket. The quantity is amazing and the price is even better. They will go a long way for me. These are pretty well made trash can liners. 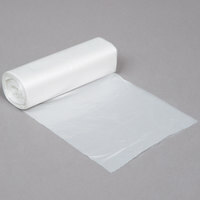 They dispense from the roll nicely, They tear at the perforations without tearing holes in the bags. Bags in a roll. How convenient ! Looks thin but durable. Good for office use and at home in bathrooms and study area Great price ! These are great office can liners. They are thin can liners but rarely ever break even when "sharper" things are thrown away. Would definitely recommend. These bags are very excellent. These bags are sturdy, and they can contain all our trash. They are perfect for daily use at our home. These are great, durable bags. We actually ordered the wrong size, but since they are so good, we are using them at home. Look very thin, but they are strong. We use these for our guest rooms and within our offices and they work great. They are extremely durable and so much cheaper than the distributor we were using. The housekeepers didn't even notice we were ordering a different kind of bag. I would recommend this product. These trash can liners are a great value for the item. They are strong and sturdy enough to handle most environments in our store and are a great fit for our waste cans. These are great bags for use in a small garbage can. They are easy to tie off since they don't come with tie strings. You can use a few different sizes of garbage can with these. Great trash bags, great price. They do often get punctured because they are kind of thin so if you will be throwing away a lot of sharp objects like plastic utensils you may want something more heavy duty. 'these are excellent bags for trash using a smaller automatic lid-type of container. well constructed, holds trash well, keeps odors locked in. Pricing very good as well. The trash can liners come in rolls and easily fit into the bottom of our trash cans. The convenience of just unrolling a bag is great and such a time saver. They are perfect for an office trash can, keeping empty lunch wraps and the occasional coffee cup from leaking their remnants.